How do I create a form for this? I’m not sure where in Drive I stored these, and they may be in different places. I accidentally made a form that is linked to a new sheet, and now the sheet won’t go away. What do I do? How do I make a pdf from SAE? How do I limit the number of characters allowed in the form? I want to change the categories. How does that work? How do I set up the Birthdays sheet? The form is supplied! We made a form ready to go just for you. Open this link to get the form, then follow the directions on our Setup page. If you can open either your form or the sheet, you can use the file menu and choose Move To to see where the file is now or move it to a new location. If you have no idea where either is, go to Google Drive and try Search. Search for SAE or School Announcements. If all else fails, re-start the setup process with a new copy of our form. We suggest storing the form and spreadsheet in a dedicated folder. I accidentally made a form that is linked to this sheet, and now the sheet won’t go away. What do I do? Copy any data needed from the bad sheet to the good one. This step may not be necessary, but just in case you have data there that is needed, you can copy from one to the other. Right-click the tab for the sheet you are not keeping and choose Unlink form. Delete the sheet you are choosing not to keep; right-click the tab and choose Delete. 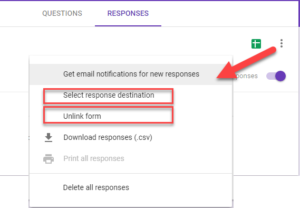 If you are not sure which form is which, you can check the destination sheet by selecting Responses in your form. On the Responses page for your form, choose the three vertical dots and choose Select response destination. if there is no destination shown, just close the dialog and leave it. If it shows the wrong destination, you can always go back to the previous window and choose Unlink form. How do I make a pdf from this? With your bulletin sheet selected, choose File>Download As>pdf. Be sure to select the desired page orientation. We recommend Portrait. Download. The pdf file will probably go to your Downloads folder. Yes. Given an open forum, some staff members will write epic treatises rather than concise announcements. In Section 3 of 3, Bulletin Item Text, click on the section to edit it. Select Minimum Character Count and change it to Maximum Character Count. Enter the number of characters (not words) in the Number blank. We’ve found 500 to be reasonable, but can be restrictive for some situations. If you like enter a short statement in the Custom error text blank; “It’s a bulletin, not War and Peace!” or whatever you like. In the SAE form, find Section 2 of 3. All the categories can be edited. Leave the numbers. These create the order the sections are presented in in your bulletin. 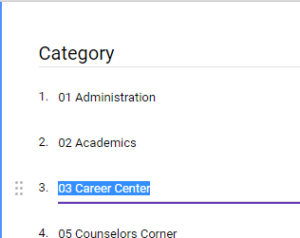 You can rearrange the order or change the section names, but leaving the numbers is important not only to the order, but to the Add-on since the first three characters of each category are removed before creating section headers in your bulletin. If you are representing a school, you can download birthdays as a report. Aeries, for example, may have the capability of creating monthly birthday listings. These include the birthday, day of the month, and student name. Download this to an Excel sheet. In Excel, delete the column with the day of the month. If the listing shows LN, FN, you may want to use the data to columns function to separate the names, then create a formula to concatenate names in to FN LN format. Copy the two columns of data to the Birthdays sheet. What else is in the works?